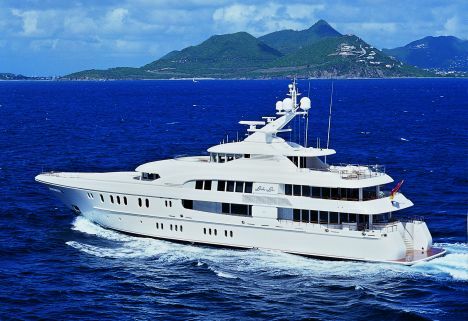 Linda Lou is one of the most recent examples of the German yard Lürssen's production capacities and the mastery of designers Espen Oeino (exterior) and Francois Zuretti (interior). range at 12 knots: 5.000 n. m.
tenders: 2 x Novurania 660 DL. 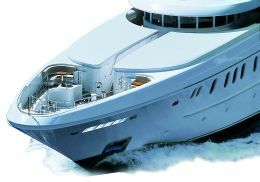 For further information contact Lürssen Yachts, Zum Alten Speicher 11; 28759 Bremen - Germany; tel. 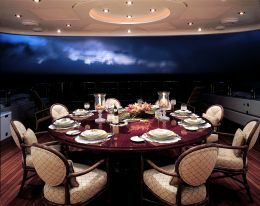 +49 421 6604166; fax +49 421 6604170; email yachts@lurssen.com; website www.lurssen.com. We've already had occasion to describe the yard's important shipbuilding activities and recount its history in the magazine, but today we feel it's important to draw attention to these points so that the reader clearly understands where and how Linda Lou came into being. Lürssen Yachts' long history goes back to 1875 and is marked by great successes in terms of shipbuilding and applied research. It isn't by mere chance that the yard is still involved in building ships of all kinds, including special vessels and warships for the armed forces, vessels that call for avant- garde building skills obtainable only through constant commitment to research and development, a very busy department at Lürssen's. All this comes under the philosophy that has always animated the personnel whose daily lives are spent working in the yard: starting with founder Friedrich Lürssen who stated that his aim was to make his signature synonymous with performance and quality. Undoubtedly the yard's innumerable firsts throughout its history - in both civil and military fields - confirm that there was, and still is, a desire to make Lürssen's a mine of ideas, with research and development at the centre of its activities and subsequently translated into ships, as in the case of Linda Lou. We'd like to describe once more the many successes achieved by Lürssen's fervent activity over the years, but for reasons of space we'll limit ourselves to recalling that the world's first motor vessel was built in this yard in 1886, as was the first fast vessel for coastal patrol, with semi-displacement hull, and also the first ever diesel powered vessel. Indubitably these events are milestones in the history of shipbuilding development and are just reason for pride on the part of those who work daily at the Lürssen yard. Having made this due reference to what lies behind a project like Linda Lou, lets take a look at the yacht herself. The owner originally intended to commission a more compact boat but after seeing Capri, another important Lürssen creation, he changed his mind and went for something similar, something decidedly more imposing and impressive. Setting out from the dimensions of Capri, designer Espen Oeino developed new lines, eliminating the side gangways of the main deck and thus creating a full-beam superstructure. This solution led to obtaining decidedly greater interior volumes, although the dimensions of the whole would have in any case guaranteed considerable space. But as they say, "the more you have the more you want". The design is developed on five decks where the second lower-deck is almost entirely given over to technical areas and the crew. 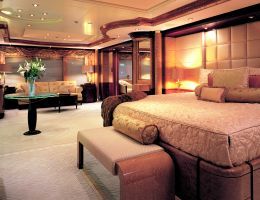 The latter have a large size mess directly accessible from their night zone, which is forward on the first lower-deck where, amidships, there are also four spacious guest cabins, all with double bed and large private bathroom. The main deck is divided into three basic parts. 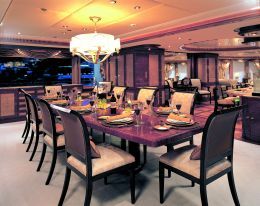 The zone from stern to amidships is for daytime activities and relaxation, with an open air dining area aft. 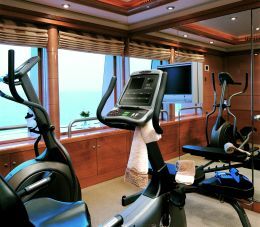 Indoors there's a spacious saloon with bar and dining area, a multimedia room with video-audio system and sofa, the galley and rooms where the crew carry out activities to ensure well-being aboard. The entire area forward is occupied by the owner's suite, accessible by way of a corridor where there is also access to a daytime bathroom. The entrance to the owner's suite passes through a small drawing-room which may also be considered as an office since the spaces and furnishings facilitate this twofold use. The owner's night area is full-beam and includes a double bed on the port side and, on the starboard side, a relaxation area with sofa, table and armchair, the furnishings being completed with another small table and a dressing table area, plus two walk-in wardrobes. There are two bathrooms for the owner and his wife, both equipped with showers and one also with a Jacuzzi. On the same deck but outdoors at the bow there are three relaxation areas that delimit the three corners of the zone they stand on which, at the centre, also houses the technical accessories for mooring. 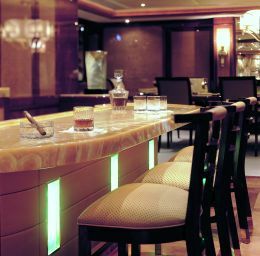 The first upper- deck, except the section forward, is almost entirely for relaxation: in the open air aft where on one side there's a coffee table and four armchairs and on the other a table with two armchairs; or indoors in the semicircular saloon whose large windows face aft and which is furnished with sofas, card tables, armchairs, bar and another daytime bathroom. 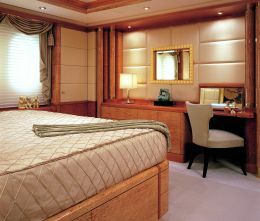 The forward zone of this deck is reserved for the ship's command, which is to say not only the great bridge, whose windows permit visibility in line with the needs of such a large vessel, but also the captain's quarters which include an office and a cabin with double bed and private bathroom, the whole developed in such a way as to take account of the owner's need for privacy. Let's move on to the final, second upper-deck which is also divided into three distinct zones, two outdoors forward and aft, and one indoors with windows along almost the whole perimeter. The area aft is for sunbathing and meals in the open air while the central section is furnished with a large round dining table, a bar with seats, a sofa set athwartship facing forward and a perimeter sofa in the bow interrupted only by the central passage to the open air zone forward. Here there is a circular Jacuzzi, a sofa and a round table. One of the stylistic elements we think worth mentioning is the external spiral staircase on the starboard side aft which links the main deck with the upper ones. It's enclosed in a circular structure in glass and steel. A noteworthy fact is that that circular or partly circular elements are often repeated, contributing to the creation of an original and harmonious layout. As for the furnishings and facings, Francois Zuretti has made use of rare and precious materials, woods and fabrics which, combined through attentive study of colours and tactile perceptions, also contribute to making each space warm and welcoming. Obviously with a pleasure craft of this kind the shipbuilder has to study not only aspects of appearance and liveability. In fact the hull, the propulsion system and on-board plant were developed and created in accordance with the owner's wish to undertake long and demanding cruises. So everything aboard Linda Lou has been developed along the lines of MCA regulations, with consequent certification. 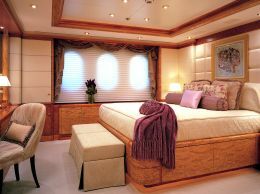 Another important matter that received special attention during design and construction of this yacht was the comfort aspect in terms of eliminating noise and vibrations. 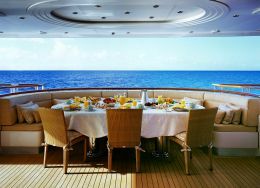 Lürssen in fact developed an advanced system that assures a high level of comfort throughout the vessel in all conditions under way. Of course this system will be used on other yachts to be launched from the Bremen yard.